USED. 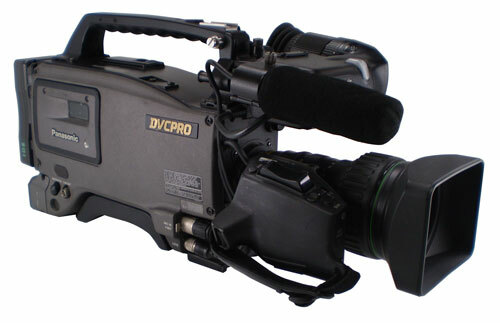 The model AJ-D400 integrates a color video camera which employs three frame interline transfer (FIT) CCDs with 410,000 device on-chip lenses with a DVCPRO format VTR which is equipped with compression technology. Signal processing is digitized by a 14.3 MHz/28.6 MHz (typ.) 10-bit AD/DA converter. The setting menu is displayed on the viewfinder screen, and controls the status displays, messages, marker displays, etc. Whether or not to display each item, as well as the display conditions when items are to be displayed, can be selected according to the user’s convenience. For example, display ON/OFF for the ! lamp display which informs the user that the unit has entered irregular status can be selected for 7 different conditions. The setting menu is also used to select various settings and functions. Using the built-in electronic shutter achieves steady images even of quickly moving subjects. In addition, the following special operation modes can also be selected. Synchro scan mode: This mode is suited for shooting personal computer and workstation monitor screens, and provides images with little horizontal stripe noise. High vertical resolution (Super V) mode: This mode provides images with high vertical resolution compared to standard mode. Eleven gain values can be selected from p3 dB to o30 dB using the setting menu and the GAIN switch. The high S/N ratio allows images with little noise to be obtained even when the gain is increased for shooting in dark locations. The black set, black balance and white balance can be automatically adjusted by simple switch operations. Adjustment values are held in the memory even if the power for the unit is turned off, so there is no need to readjust the balance each time the power is turned on. There are two memory systems for white balance which can hold four adjustment values each for the CC and ND filters, making a total of eight adjustment values. When adjustment values matching the illumination conditions are selected from among the values stored in the memory, the unit is automatically adjusted to the corresponding white balance. (A menu setting also allows adjustment of only two values instead of the values for each filter.) In addition, when the unit was shipped from the factory, the white balance value for 3200K is stored in the memory as a preset value. This value can be called when there is no time to adjust the white balance, etc.